A collection of some of the coins used by Filipinos before and during the Spanish times. Barter rings. 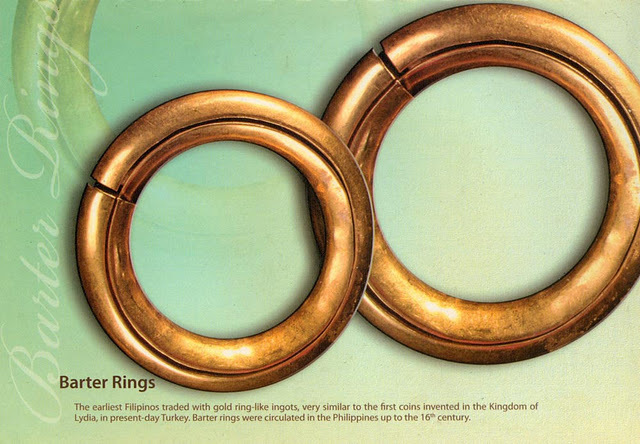 The earliest Filipinos traded with gold ring-like ingots, very similar to the first coins invented in the Kingdom of Lydia in present day Turkey. Barter rings were circulated in the Philippines up to 16th century. Piloncitos. 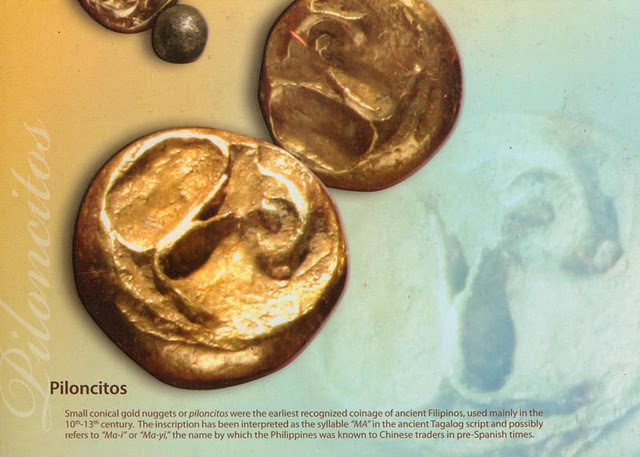 Small conical gold nuggets or piloncitos where the earliest recognized coinage of ancient Filipinos. Used mainly in the 10th to 13th century. Macuquinas or cobs. 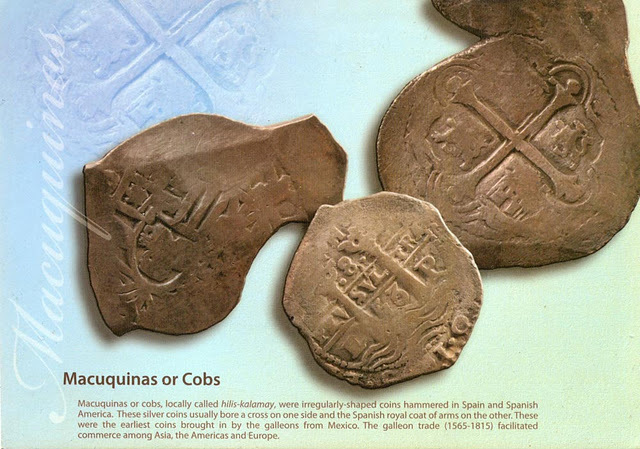 Locally called hilis-kalamay, were irregularly-shaped coins hammered in Span and Spanish America. These silver coins usually bore a cross on one side and the Spanish coat at arms on the other. These were the earliest coins brought in by the galleons from Mexico. The galleon trade (1565-1815) facilitated commerce among Asia, the Americas, and Europe. Dos Mundos. 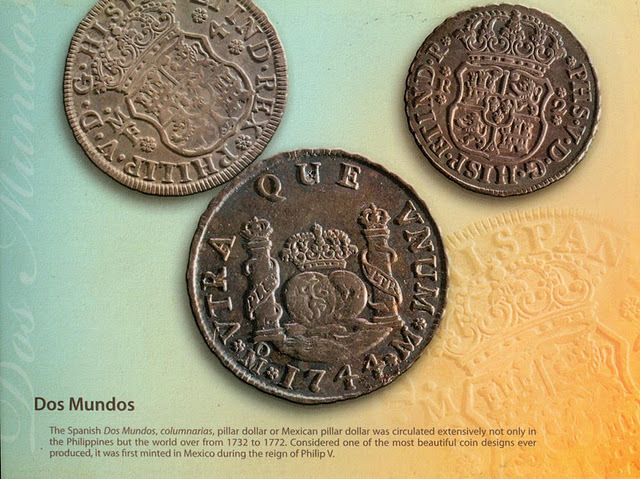 The Spanish Dos Mundos, columnarias, pillar dollar, or Mexican dollar was circulated extensively not only in the Philippines but the world over from 1732 to 1772. Considered one of the most beautiful coin designs ever produced, it was first minted in Mixico during the reign of Philip V.
Barilla. 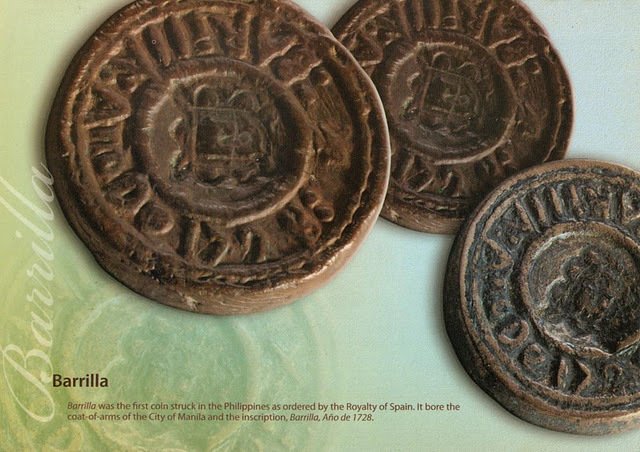 Barilla was the first coin struck in the Philippines as ordered by the Royalty of Spain. It bore the coat-at-arms of the City of Manila and the inscription Ano de 1728. Sulu coins. The Muslims of Sulu in the southermost islands engaged actively in barter trade with the Arabs, Chinese, Bornean, Moluccan, and British traders. The Sultans issued coins of their own as early as the 5th century. 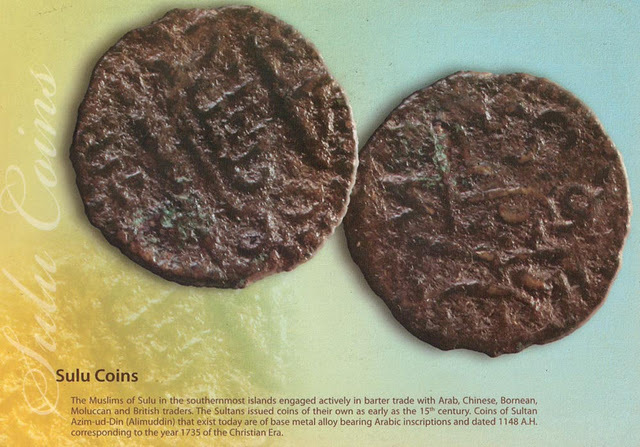 Coins of Sultan Azimud Din (Alimuddin) that exist today are of base metal alloy bearing Arabic inscriptions and dated 1148 AH corresponding to the year 1735 of the Chrisian era. Portrait series. 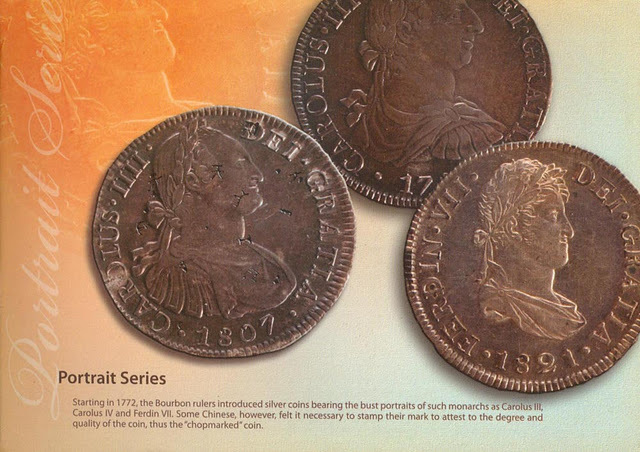 Starting in 1772, the Bourbon rulers introduced silver coins bearing the bust portraits of such monarchs as Corulos III, Carolus IV and Ferdin VII. Some Chinese however, felt it necessary to stamp their mark to attest to the degree and quality of the coin, thus "chopmarked" the coin. Counterstamped. 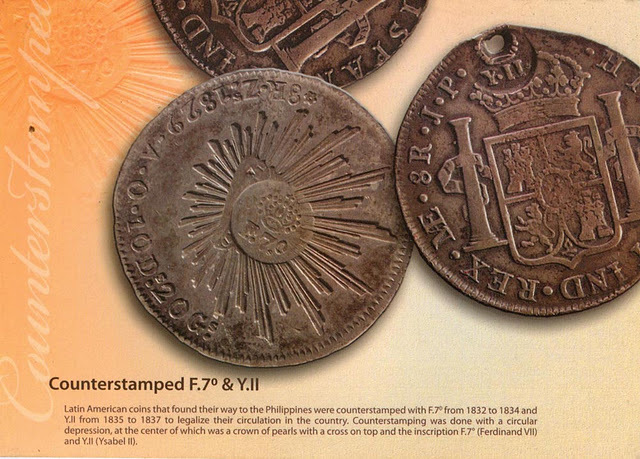 Latin American coins that found their way to the Philippines were counterstamped with F.70 (Ferdinand VII) and Y.II from 1835 to 1837. Isabelinas. 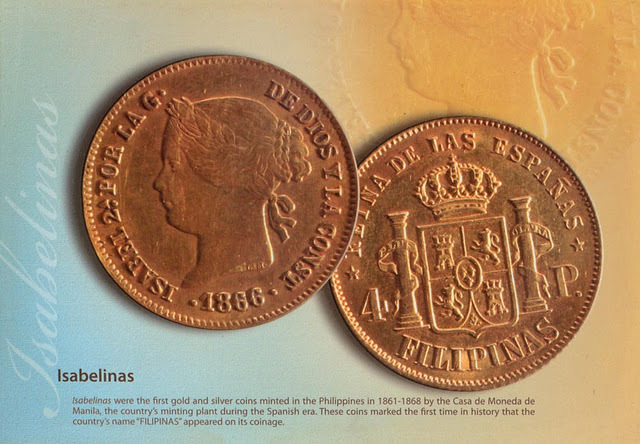 Isabelinas were the first gold and silver coins minted in the Philippines in 1861-1868 by the Case de Moneda de Manila. Alfonsinos. From 1880 to 1885, the Case de Moneda de Manila issued gold and silver cons bearing the bust of Alfonso XII who was installed on the throne of Spain in 1874. Alfonsos. 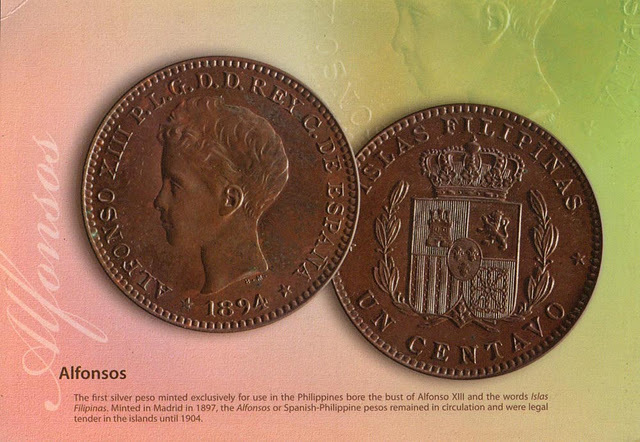 The first silver peso minted exclusively for use in the Philippines bore the bust of Alfonso XIII and the words Islas Filipinas. 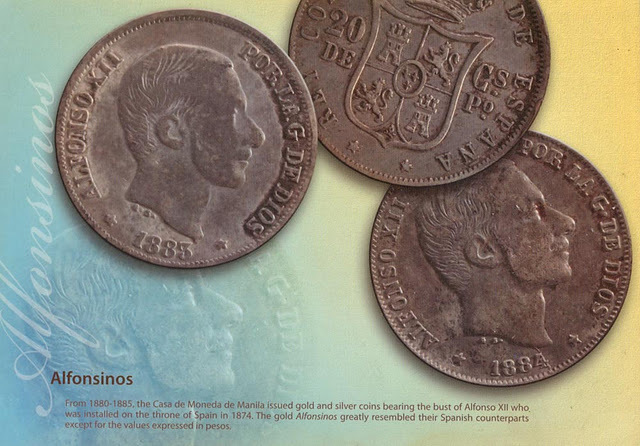 Minted in Madrid 1897, the Alfonsos or the Spanish-Philippine pesos remained in circulation and were legal tender in the islands until 1904.